Architecture studio GAFPA used low-cost materials to build this Japanese-inspired weekend retreat in northern Belgium, which features a slender spiral staircase (+ slideshow). 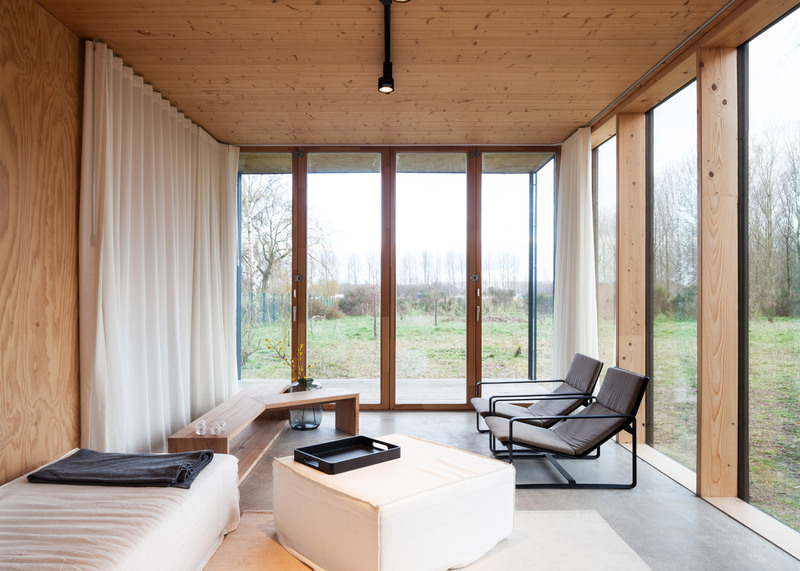 GAFPA – which also recently slotted a wooden house into an old industrial building – was asked by a Ghent-based couple to design a weekend home for them in Wachtebeke, an East Flanders town around an hour outside of the city. 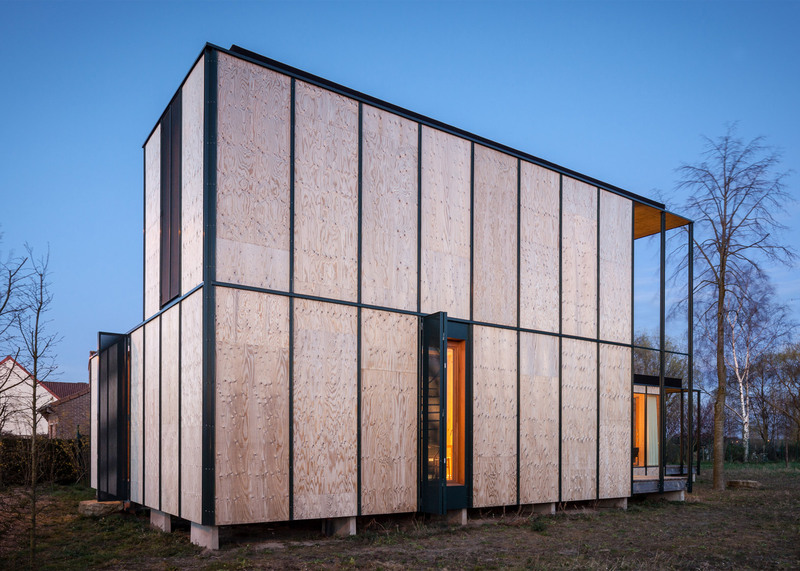 The architects chose to highlight the temporary nature of the building's use by employing simple materials. 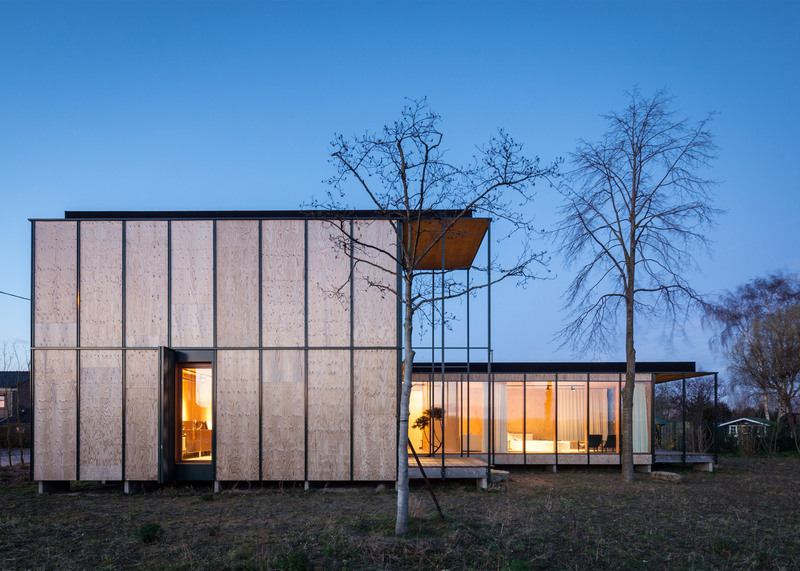 With plywood walls and a structure of repeated metal profiles, it has a lot in common with houses built by Japanese architects. "The weekend house gives its residents the chance to escape from everyday life," reads a statement provided by GAFPA. "In its lightness, it seems only temporary." 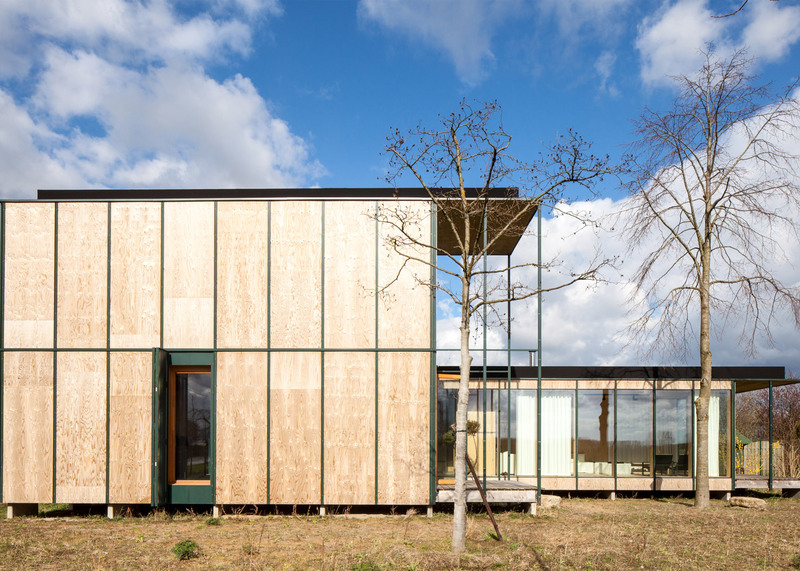 Named Weekend House Wachtebeke, the building has a concrete base that is raised off the ground on wooden feet to suggest that it could be easily moved. Similarly, its steel I-beam structure is concealed, but a series of more lightweight aluminium frames are left exposed. This misleadingly implies the structure could be dismantled without much difficulty – like one of the flat-pack homes designed by French architect Jean Prouvé after the second world war. "The way this wooden house rests on the concrete surfaces is reminiscent of traditional Japanese architecture," reads GAFPA's statement. 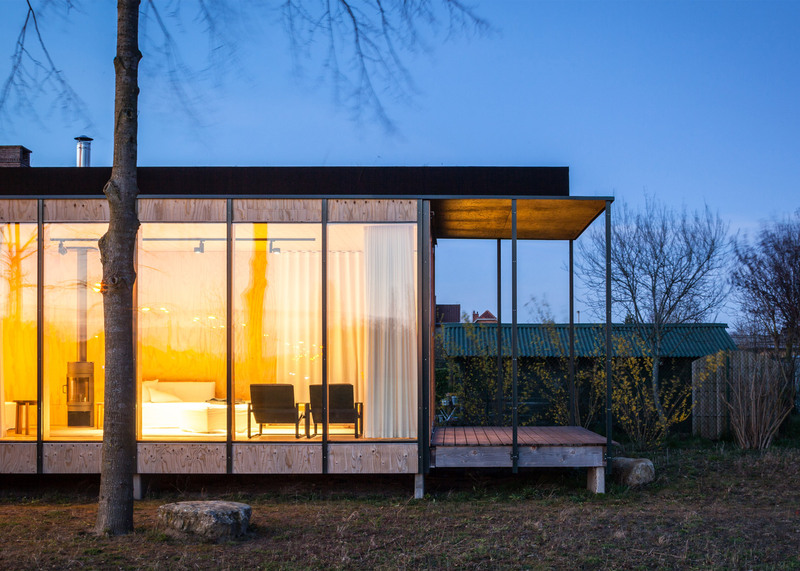 "The design turns his gaze, however, clearly onto Western experiments with light structures of standard elements, such as the private residences of Jean Prouvé and Charles and Ray Eames." The house is located between a road and an agricultural field. It is U-shaped in plan, which naturally divides the interior into two wings and also creates a protected space in between. Living spaces are located in each wing, and both open out to a partially sheltered terrace. One side accommodates a family lounge, while the other side provides a kitchen and dining space. The children's bedrooms are deliberately small spaces tucked away at the back, and the clients sleep on a mezzanine deck, elevated up above the kitchen. The spiral staircase is positioned between the kitchen and the dining area, providing clear access to this small upper deck. Like the aluminium frames outside, the metal has been coated with a dark green varnish. 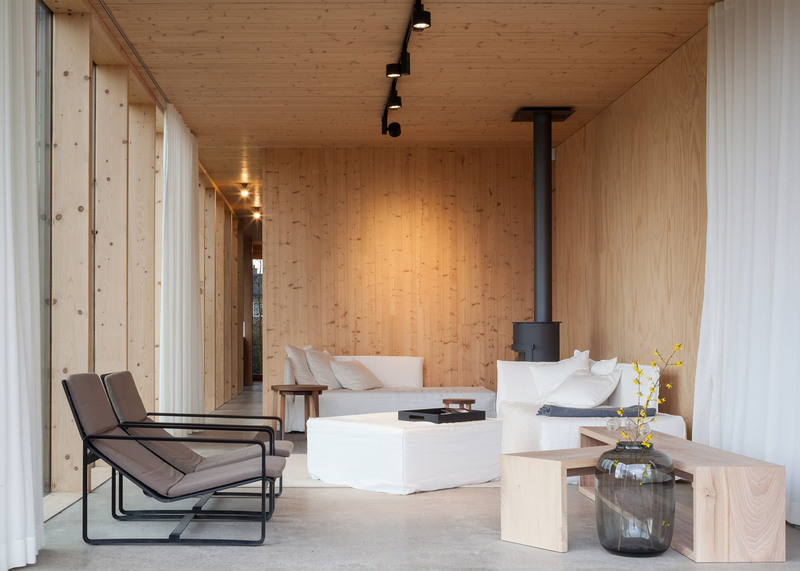 The plywood walls are left exposed both inside and out and the same material forms ceilings, while the flooring is provided by a layer of polished screed. Folding doors allow the owners to open their living spaces up to the terraces. There are also expansive areas of glazing, offering views out over the yellow forsythia bushes to the landscape beyond. As is common in Japan, a small tree was planted at the centre of the building. Several rocks are dotted around the perimeter to form stepping stones, and there is also a concrete water basin nestling into the ground. 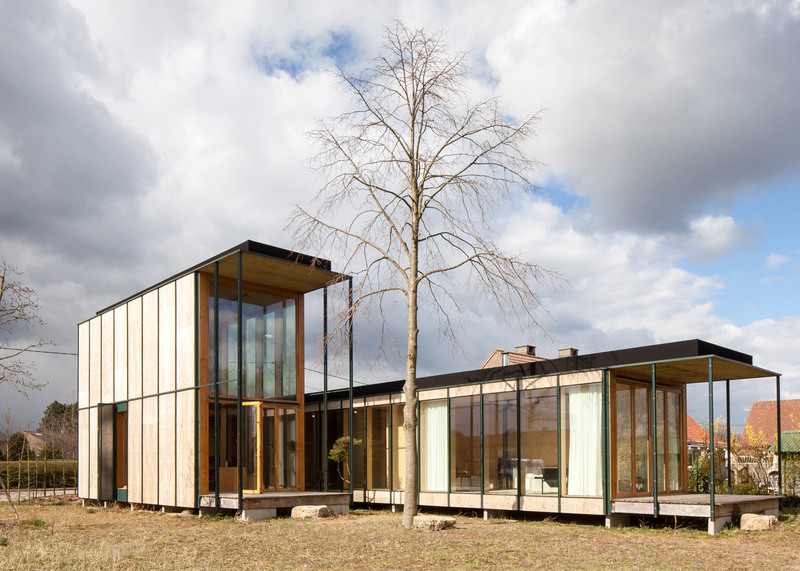 GAFPA is a Ghent-based studio led by architects Floris De Bruyn, Philippe De Berlangeer and Frederick Verschueren. 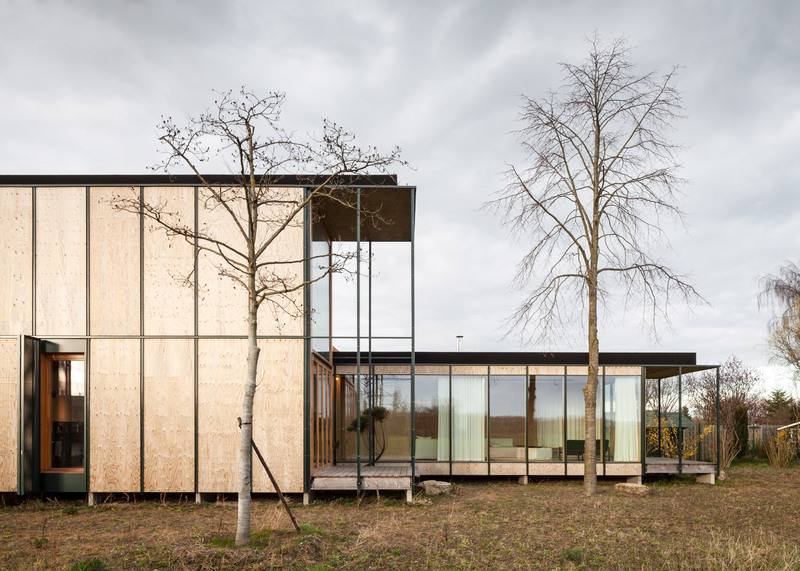 Other recent projects to come out of the Belgian city include an apartment complex that creates optical illusions and a forest-inspired house extension.